Atomic Punk has been an active HeroMachine participant ever since I can remember, and I jumped at the chance to get to know a bit more about him. Enjoy! Favorite all-time geeky movie if any: Blade Runner. The elements of film noir in a gritty street detective story. Favorite all-time geeky book if any: Not a book, but collections of H.G. Wells' short stories. His writing style is crisp and concise. He was a visionary ("The Land Ironclads", "A Story of the Days to Come"). I consider him the godfather of steampunk. Favorite all-time geeky TV show if any: Farscape. It doesn't spoon-feed the audience. And Claudia Black's accent is total swoonage. Favorite all-time comic book character if any: Judge Dredd. His black-and-white, uncompromising delivery of justice adds to the absurdity of the post-apocalypse dystopia that is MegaCity One. I even liked the movie. If you could have one super-heroic power in real life, you'd choose: Flight. I don't drive. Public transportation where I live is like riding with my dad. It never goes direct from Point A to B. So you waste an extra 20 minutes stopping at Points C, D, 29, and Purple. In your leisure time you like to: Listen to music. Quilt. Watch sports (mostly football and Professional Bull Riding). Meet the gang for hot wings and beer. Complain that I need to lose 10 pounds then do nothing about it. Character design turn-ons (things you love to see that make for a good design): Morphing items for new purposes. Puns. Complementary colors. Character design turn-offs (things you hate to see that make for a bad design): Over-accessorizing, disproportionate limbs. Sometimes skewed appendages are an attempt to create perspective. I try to overlook design flaws to see the creator's intent. Best tip for a HeroMachine newbie: Have fun! HM is about sharing. I'm flattered that Jeff asked me to submit my profile. I consider myself a "prolific" user not a power user. I lost the second round of "FNF: Robin Hood in Space" by one vote! So don't get upset if you don't win a contest (or, just keep it to yourself). I have as much fun surfing the net for contest ideas and writing the background stories as I do designing the characters. For younger HM'ers, this is a good way to learn new things. Maybe even useful for that research paper due tomorrow. For us older HM'ers, it's a good way to reconnect. I work with numbers and talk to people on the phone all day. HeroMachine helps me relax by "winding down" my brain. Trust me, if you have a million things on your mind, you can't just quit thinking. You simply flip the off switch, you crash hard. Any personal message you'd like to share with the HeroMachine community about Geek Life: Being a geek has advantages. Geeks are knowledge sponges. Willing to consider new possibilities and ideas. Finding creative approaches. The downside being geeks get hung up on considering every possibility or idea. Even when there is a direct solution or only one answer, geeks tend to over-analyze and engage in meaningless debate. This can be a problem when interacting with non-geeks and especially bosses. Decorate your work area but don't make it too comfy. If you fill it with too many of your favorite things, it blurs the line between work and play. It also might draw some unwanted attention. For awhile, I had my "Jägermonster" and "Tesla Ranger" pins on my desk. Someone asked me about them I was all too happy to tell her about "Girl Genius Comics." She still looks at me like I'm a bit touched though the badges are now safe at home. Congrats and good info. I couldn’t open the archive though, it said internet page error when I tried to open the link. Awesome! I have to admit, given the whimsical nature of many of your posts, and, frankly, an implication of heavy drinking that would probably kill me if I tried to imitate it, you’ve always seemed like one of the more interesting people on here. 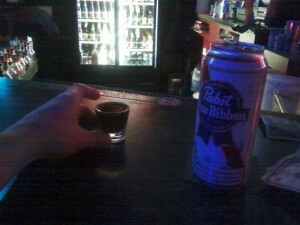 The profile pic seems so appropriate (although I question the PBR in such prominent display). Also, don’t sell yourself short on your HM3 skills. It seems a rare contest when an Atomic Punk entry hasn’t made honorable mention, even if you don’t seem to win. So you definitely show a lot of talent here; your Power User status is well earned. So you waste an extra 20 minutes stopping at Points C, D, 29, and Purple. This seems so familiar. Is it a reference? I’m thinking Douglas Adams. Or something equally absurd. Congrats AP! One of my favorite posters on HM. Always has great entries and well deserving of this honor! Grats Atomic Punk! Truly deserved for someone that has been in every contest for a very long while. I looked through your archive (broken link btw!) and I must say that I laughed quite a bit at Seer Hack. It reflects two of the things you mention above – puns as a character turn on, and irritation with public transport! Nebraska for the win, Atomic! @Tool: There seems to be an extra “/http/” in there. Here is the correct link. Thanks for visiting! @Myro: Yes, Adams explains the futility of commuting in the opening pages of “The Hitchhiker’s Guide to the Galaxy.” His observation is hilariously true. In the case of my dad, he will go to Store #1, buy one thing then drive across town to buy something else at Store #2. In between, he takes at least two side trips. All in order to “save” 20 cents for the same item available at Store #1. Figure in time and gas, he over-charges himself at least $3 every time! Sorry about that rant. PBR and Jaegermeister? I knew of that recipe long before the Zac Brown Band began singing its praises! @Gero: The movie was campy and rather dry. How could a Dredd fan not like it! It wasn’t going to win any awards (well, maybe a Razzy). Still, it was nice for someone in Hollywoodland to throw a bone to “underground” comics. Ok, I’m getting sentimental over a crappy Sylvester Stallone movie. Now, if that ain’t unconditional fandom! Might be a little late, but I wish they would do Sandman or Grendel (Kevin Matchstick). Or Alien Legion! Yeah, dream on, fanboy. Special thanks again to our host, Mr. Hebert, for giving us a little program that has grown into an on-line community. My sincere apologies for messing up the link. I’ve fixed it now. I’ve always appreciated the old school Van Halen shout out that is your screen name, AP. I have always been interested in your entries Atomic Punk. I think you add a unique perspective to the contests.